The best camera wrist straps in 2019 are built to last and are both functional and fashionable for everyday photography and videography. After years of photoshoots, I’ve found that the generic camera strap that came with my camera just didn’t cut it for me. I needed different camera straps for different situations and I looked online everywhere to find the right camera strap for my needs. Since my main work consists of more run and gun photography, I’ve grown to appreciate how convenient camera wrist straps are. Now that I’ve had the opportunity to test out several camera straps, I have a better understanding of what makes a good camera strap. I have a couple of camera straps that I now rely on daily and can trust to hold my camera without worry. So, I put together a short list of some of the best camera wrist straps on the market so you have a better idea of what strap might work for you! The best camera straps don’t always have to be these long shoulder or sling straps. Often times, the smaller camera wrist straps are more minimal to carry-around and don’t have the added clunkiness of a shoulder strap. 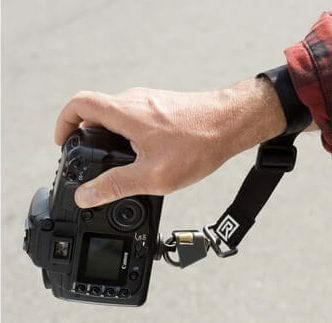 Camera wrist straps have great functionality and are preferred by many professional photographers. Some photographers argue that wrist straps aren’t always the best because they fail to properly support larger DSLR cameras. Some say that it becomes quite a problem on longer photoshoots. Yet, I find the camera wrist strap convenient since it allows me to access my camera more easily. I’m not here to compare the different types of camera straps because they all have their pros and cons. But from my experience, here are my recommendations on some of the best camera wrist straps in 2019. DSPTCH makes really useful and very functional camera wrist straps for your compact camera setups, but also larger DSLRs. The DSPTCH wrist strap in particular is a lightweight solution designed for more flexibility and versatility on photoshoots. The strap opens to an adjustable size of 8 – 11 inches and has a maximum length of 16 inches. The DSPTCH is my favorite paracord camera strap and it is designed with a half inch QR connector. The small elastic loop ties to one of the lugs on your camera body securely. And then it connects to the camera wrist strap with a flat slide buckle making sure your camera is locked-in tight. The detachable stainless steel clip ensures that the strap has a firm, but not tight grip around your wrist. Buy more than one of these DSPTCH straps and you can attach one elastic loop for each of your cameras. This allows you to quickly detach one camera and attach another one without having to take off the whole wrist strap. This saves you a considerable amount of time when you are shooting with two cameras and want to have the one you are shooting with at hand. First off, the HoldFast Gear Camera leash is crafted out of genuine American bison leather and it is a very functional and durable strap. The leash is build with a split ring on one end of the camera strap and a D-ring at the other end. 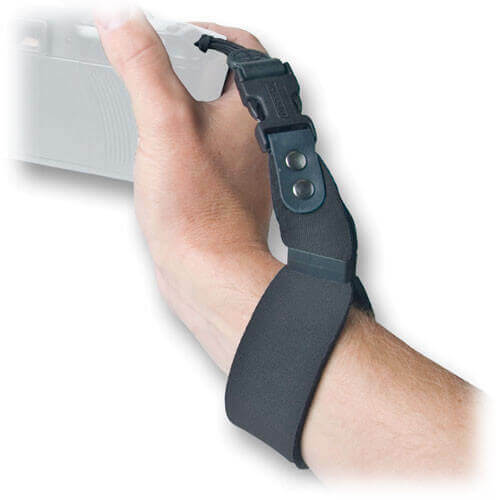 The wrist strap is compatible with the Money Maker harness system. This allows you to attach an additional camera body to the system and use it as a proper harness, thereby extending its usability. 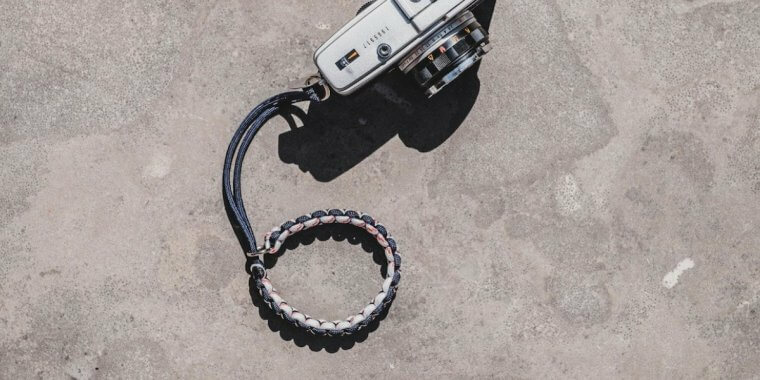 Optionally, you can also use the Camera Leash as a wrist strap or a key ring. The camera attachment strap is 15.3 inches long. OP/Tech is one of the leading camera strap brands in the world. The OP/Tech wrist strap is ideal for small to medium DSLRs. This wrist strap is made out of a solid nylon webbed material. The sort of material that is used for car seat belts so that should give you a general idea of its strength. The material is tough enough to support about 10 pounds of camera gear. This makes it suitable for a wide range of DSLR cameras including most semi-pro models with heavier zoom lenses. The length is the smallest so far at 11 inches making it small enough to wrap around your wrist firmly. The strap comes with a 1.375 inch wide neoprene pad with a leather finish for a softer feel to it. To attach the strap to the camera a uni-loop system is used. 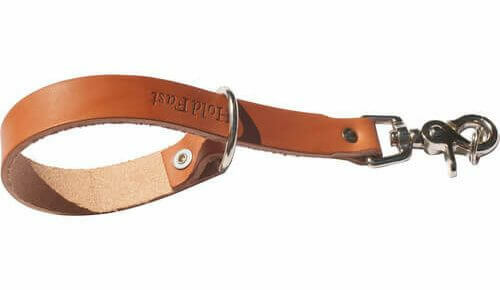 In order to fasten the strap around your wrist, a security slide buckle is also provided. You can’t leave Joby out of the camera strap discussion. 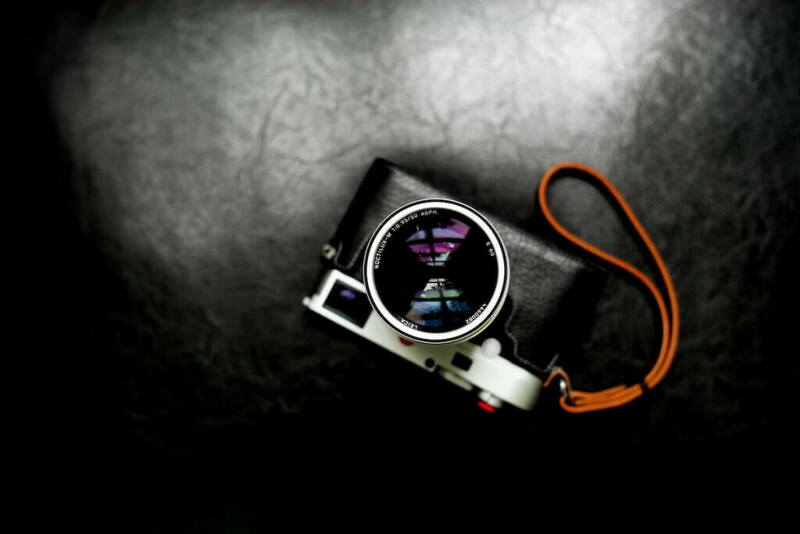 Joby is known amongst photographers worldwide for their quality camera accessories and they hold a highly rated camera wrist strap. This particular Joby camera strap is suitable for most medium to entry level DSLRs and mirrorless camera systems. The attachment belt on the strap fastens to the slug of your camera creating a firm hold. There is an adjustable cord lock stopper as well to make sure that your camera is secured in place. The unique slide lock tightens the strap if the camera happens to drop from your hand. This prevents your camera from swinging out and potentially hitting surrounding objects. Joby’s design is a smart way to prevent costly camera accidents. 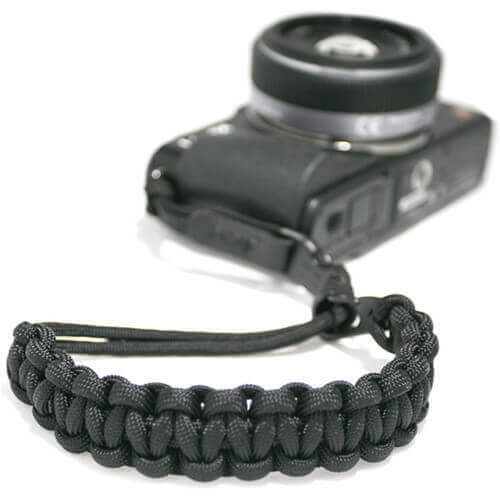 Additionally, the braided nylon cord on these straps is very durable which add to the protection of your camera. BlackRapid is one of my favorite brands and they are very reputable when it comes to camera straps. They make useful products for photographers and this BlackRapid camera wrist strap is no different. By far one of the best camera wrist straps in the business. The material used to craft this is a webbed nylon material. Once again this is material used for car seat belts, so it can withstand a large camera load. The durable CR-3 ConnectR is a locking carabiner that holds the weight of your camera and lens combination with ease. The camera wrist strap also comes with an integrated D-ring. What’s cool about the BlackRapid strap is that a tripod mount is also provided. This is useful when you want to quickly mount your camera to a tripod for a few stabilized shots and then move back to handheld shooting immediately after. There’s not a single camera strap out there that can be titled the best camera wrist strap for all photographers or videographers. The truth is, every camera owner uses the camera in a different way. 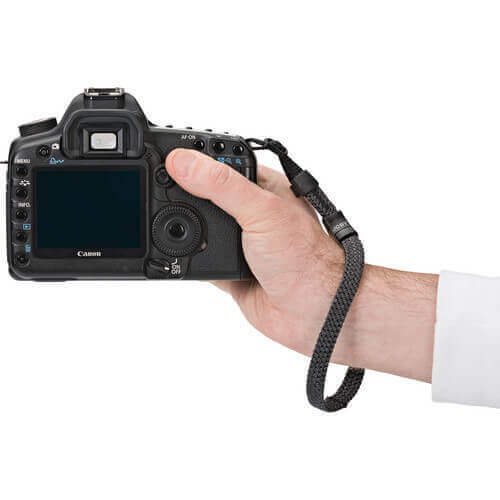 The best camera wrist strap in 2019 is the one that works best for your photoshoot needs. The camera straps I’ve recommended are highly rated and are commonly used amongst the pros, but choose based on what strap fits your own needs. For me, I personally prefer to use a paracord camera wrist strap, so the DSPTCH camera straps are the best ones for me since I can change between them quickly. So if you’re looking for the best camera wrist strap in 2019, I would recommend checking out the list of different camera strap options I’ve provided and seeing which one is best suited for you! Do you have any recommendations for camera wrist straps? I would love to hear them, so drop a comment down below!